The government stands firm on its position. Taiwanese president Ma Ying-jeou said Tuesday that his government would “staunchly defend” its South China Sea claims just as the Philippines’ case against China’s South China Sea claims kicks off before a United Nations arbitral tribunal at The Hague. Taiwan, one of six claimants in the South China Sea, shares China’s claim to virtually the entire South China Sea that dates back before the split between the Communists and Nationalists in 1949 following the Chinese Civil War. It has occupied Itu Aba (which it calls Taiping Island), the largest feature in the South China Sea, since 1956. “The ROC government will staunchly defend its sovereignty over Taiping and every right held by the country under international law,” Ma said in speech at an international conference in Taipei commemorating the 70th anniversary of Chinese nationalist forces’ victory in the war against Japan. Noting Taiwan’s had built up infrastructure on Itu Aba – including an airstrip, a hospital and communications and solar energy systems – he said that it would continue to develop the island for peaceful purposes. As I have noted previously, Ma’s government has been paying increasing attention to building up its capabilities and defending its sovereignty there (See: “Confirmed: Taiwan to Start New South China Sea Patrols” and “Vietnam a Growing Threat to Taiwan’s South China Sea Claims: Report”). “In the future, the ROC government will continue development and Taiping with the aim of peace, to make it a hub for humanitarian assistance, environmental protection and scientific research in the Spratly Islands,” Ma said. Ma’s remarks come as the Philippines’ case against China’s South China Sea claims gets underway at the Permanent Court of Arbitration at The Hague. The speech was also deliered just three days after his administration held one of Taiwan’s largest military displays in commemoration of the 70th anniversary. Meanwhile, the Ministry of Foreign Affairs issued a separate statement Tuesday clarifying Taiwan’s position on and its peaceful intentions in the South China Sea. The statement began by arguing that Itu Aba “indisputably qualifies” as an ‘island’ under Article 121 of the United Nations Convention on the Law of the Sea (UNCLOS). The designation of an ‘island’ is important because it entitles Taipei to an exclusive economic zone (EEZ) and continental shelf. “The ROC government will firmly defend this fact. 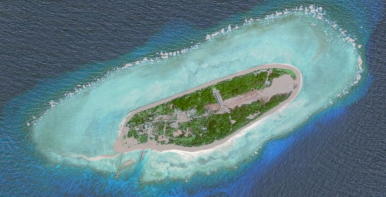 Any claims by other countries which aim to deny this fact will not impair the legal status of Taiping Island (Itu Aba) and its maritime rights based on UNCLOS,” the statement said. The statement went on to note that Taiwan had “actively promoted peaceful utilization of the South China Sea,” including promoting international maritime research and organizing study camps to enhance awareness among the youth on the importance of peacefully resolving disputes. It also stressed that Taiwan had defended its claims without getting into conflict with other nations or interfering with their freedom of navigation or overflight in the South China Sea – a clear attempt to distinguish itself from China’s behavior despite their similar claims. “The ROC government calls on countries bordering the South China Sea to respect the spirit and principles of the UN Charter and UNCLOS, and to exercise restraint, safeguard peace and stability in the South China Sea, and refrain from taking any unilateral action that might escalate tensions,” the statement added. Ma’s government has been positioning Taiwan as a peaceful actor seeking constructive ways to resolve the disputes, including through its proposed South China Sea Peace Initiative announced in May which stresses shelving disagreements and pursuing negotiations on sharing resources. The statement essentially reiterated this general approach but warned that any arrangement or agreement pursued without Taiwan would not be recognized. “Any arrangement or agreement…that is reached without ROC participation and consent shall have no legal effect on the ROC and shall not be recognized by the ROC government,” the statement said. Tsai will need to have a strategy for handling Taiwan's sovereignty claims in the South China Sea.